Bugs, bugs, bugs. Bugs are commonly considered household pests which bring out an automatic "eew!!" reaction in just about everybody. When you ask why, the answer might be "I'm afraid they'll bite me" or even "I don't know, I just hate them." Look a little closer, though, and you'll find good reason to fear some insect species, while others prove to be surprisingly beneficial. Ants are a nuisance when they invade your kitchen in search of a snack. (They especially love sweets!) Some species, like fire ants, also have an annoying sting. Carpenter ants should really be called "demo ants," for their tendency to carve out tunnels, damaging wooden buildings and structures like doors, porches, and decks. But did you know that ants can threaten your home in another way? They like to build their nests near concrete pads, like the one the outside component of your air conditioner sits on. From there, they often crawl into the A/C housing, causing short circuits and other mechanical problems. The best solution is to install physical barriers, by screening off the unit and filling holes around the base with caulk, copper wool, or foam or rubber gaskets. Do be careful that you don't block essential ventilation, though. Flies are one of the least frightening household pests to the majority of us because we know that they don't bite or sting. However, if you think the worst they can do is buzz around your head while you're trying to balance your credit card statement, think again. Because flies often carry dangerous diseases which they are ready and willing to "share" with humans, it's important to keep them outside of your space. Install window screens. Minimize odors that attract flies in the first place, too. They love the delicious aromas of rotting food and waste, so use tightly covered garbage cans, take scraps out to the compost pile (which should not be located right next to your house) promptly, and clean Fluffy's litter box often. Mites, in the form of dust mites, tend to be well known to people who suffer from allergies and/or asthma. Dust mites, which feed off dead skin particles shed by you and your pets, are powerful allergy triggers and must be kept under control with bedding protectors and rigorous house cleaning. Not as serious but certainly unpleasant are biting mites, minuscule creatures whose bite nevertheless packs a powerful punch, causing severe irritation and itching. Usually animal hosts -- wild birds or rodents -- are responsible for bringing biting mites into houses. Therefore, it's important to prevent the host's access to your home in order to control the insects. Seal up holes and cap your chimney. Spiders are widely feared by human beings. In fact, one scientific study showed that arachnophobia might even be inherited! Even though spiders may set off your "ick" response, though, chances are that they won't actually hurt you. There are relatively few poisonous spider species in the United States. In fact, if you can stand to keep them around, these arachnids (the scientific class to which spiders belong; contrary to popular belief, they are not insects) serve a very positive purpose. They enjoy chowing down on the likes of mosquitoes, cockroaches, clothes moths, and earwigs. 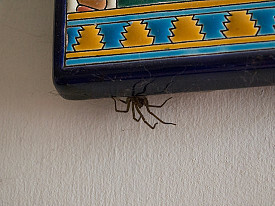 Adopting a "live and let live" policy toward that spider lurking in the corner of your room can be a very effective, eco-friendly form of pest control. Bees are famous for their painful sting. However, they normally use their stinger only in response to a perceived threat. Stomp on them, swat them, or threaten their hive and you're in big trouble, but if you find a bee in your house, your best bet is to open an window or two, then leave it alone until it makes its own way outside. Honeybees, in particular, should not be disturbed; stinging a mammal just once will cause these creatures to die. Honeybees are important not just for biological diversity; they play a valuable role in plant pollination. And with their declining population, we need to protect our honeybees as best we can.